A Chinese acquisition binge of European companies is prompting EU members to take a hard look at the costs and benefits of foreign investment. Chinese investment in Germany in particular has exploded during the past two years and shifted into high-tech industries. 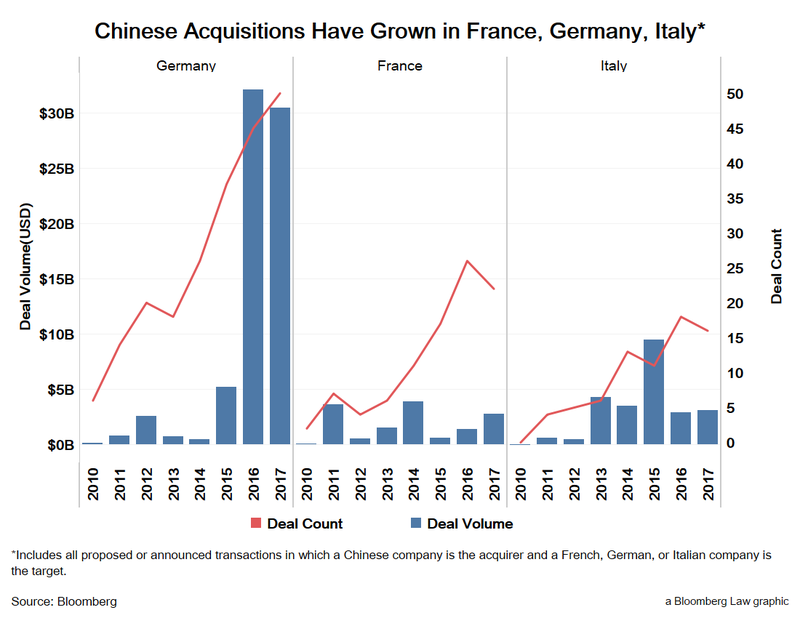 The mergers-and-acquisitions cash targeting Germany from China more than quintupled in the past three years, from $5.2 billion in 2015 to $30.5 billion in 2017, according to a Bloomberg Law analysis of Bloomberg data. France also saw a marked increase in the number of Chinese deals over the past few years. It had 22 deals with Chinese acquirers in 2017 and 26 such deals in 2016, compared with just two in 2010. The EU has proposed a new regulation that, while not aimed specifically at Chinese acquirers, would open the door to a limited EU-level review of foreign deals that are “likely to affect projects or programmes of union interest” on security or public order grounds. It aims to protect critical European assets against investment that would be detrimental to legitimate interests of the union or its member states. The proposal is already making waves, even though its chances of enactment are slim. It’s unlikely to be adopted because of opposition from some states, such as Latvia, and because of the cumbersome EU process for approving such rules, Dechert LLP Brussels partner Anne MacGregor told Bloomberg Law. Several EU members have called for an impact assessment, which would likely involve public consultation and take at least six to eight months, on top of what is already a two-year process, she said. The proposed regulation follows a February 2017 letter from France, Germany, and Italy asking the EU to consider permitting members to block foreign investment by countries that don’t allow equal access to their markets. Their letter expressed concern about “a possible sell-out of European expertise” and lack of reciprocity. The EU regulation responds by saying that screening is allowed but not required at the member state level but must be non-discriminatory and transparent. It focuses on the 12 member states out of 28 that have screening laws and seeks to foster coordination and minimum standards for those regimes. It also discusses how to introduce a screening process in nations that don’t currently have one. It proposes discussion on critical assets and an analysis of trade flows into the EU. The proposal may prompt some EU states that don’t already review foreign investment to consider new controls, MacGregor said. The proposed regulation also starts a much-needed discussion among member states on a topic that wasn’t on the mainstream radar as recently as two years ago. “The tide has turned on this,” she said. The proposal has complicated ongoing negotiations between Europe and China on an investment treaty. China has raised concerns about the EU’s proposed investment screening on the sidelines of those talks. The Chinese now regularly call the Germans protectionists, she added. Chinese investment in Germany has also shifted toward high-tech companies. Where Chinese investors had been buying real estate in the earlier part of the decade, they shifted aggressively into high-tech industries since 2015. The change has caused deep unease that Europe might lose control of important technological innovations and methods, Stanzel said. It has also fueled concern about a level playing field between EU members and China. China is a centrally planned economy that exerts some government control over even “private” companies. It provides access to funding and support that an EU member state couldn’t legally provide under EU state aid restrictions, some European analysts have noted. That could raise the threat of unfair disadvantage for domestic companies forced to compete with rivals backed by China’s deep pockets. Germany responded to public concern about Chinese investment by tightening its laws. The changes were small but significant, Stanzel said. The German government expanded the situations in which it can intervene in a proposed foreign takeover and narrowed the notice it must provide to the merging parties if it sees potential public order or security problems from a deal. The law also gives the government more time to review potential takeovers, she said. Regardless of what happens to the EU proposal, regulators in several countries are taking a harder look at Chinese investments. Sanan Optoelectronics dropped a takeover bid for German lighting and LED chip maker Osram Licht AG in December 2016, when the deal faced public, labor union, and political opposition. Chinese-backed Grand Chip Investment GmbH’s planned purchase of German semiconductor equipment maker Aixtron SE collapsed that same month, when, on U.S. government opposition, Germany reopened its review. In September 2016, Great Britain put conditions on a French-Chinese consortium to build the Hinkley Point nuclear power plant in Somerset because of controversy about China’s involvement. Nor is concern about foreign investment limited to the EU. The U.S. is considering expanding its national security reviews of cross-border deals, and Australia announced Feb. 1 that it will tighten rules on foreign investment in electricity infrastructure and agricultural land.